The lake in the remote Hongu Basin in eastern Nepal is so recent it doesn’t even have a name. It has a number: Lake 464. An alarming report released on 16 May said Himalayan glaciers have lost a quarter of their ice mass since 1977. This has resulted in many new lakes being formed at the snouts of glaciers, which could burst at any moment unleashing catastrophic floods downstream. The eastern Himalaya is melting faster than the west forming more of these new lakes, but scientists are zeroing in on Lake 464 because it is a ticking time bomb. 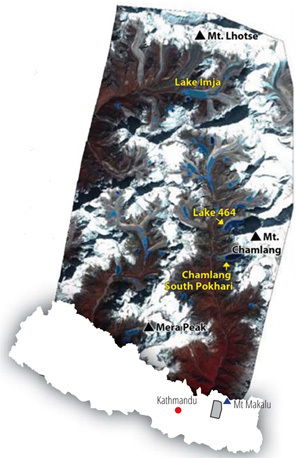 “Lake 464 is partially hidden from satellite images because it is obscured and shadowed by Mt Chamlang,” explains Alton C. Byers, director of Science and Exploration at The Mountain Institute and lead author of a 2013 study on glacial lakes in the Hinku and Hongu basins published last year in the journal Natural Hazards. “It was mostly a glacier when the Austrian climbercartographer Erwin Schneider mapped it 50 years ago, but now is a lake that contains many triggers that make it potentially dangerous,” Byers says. The lake was listed in a 2007 ICIMOD (International Centre for Integrated Mountain Development) study but wasn’t identified as potentially dangerous. But field studies in 2009 and 2010 by The Mountain Institute in the US, Hokkaido University, University of Texas at Austin, and funded by the National Geographic Society-Waittgrant program, found the lake could be at high risk of an outburst flood. “There are four or five huge overhanging ice masses that could fall into the lake and cause a surge wave that overtops the terminal moraine,” says Byers. Similar avalanche-induced glacial lake outburst floods (GLOFs) in 1985 created the Langmoche flood in the Khumbu, and in 1998 caused the Tama Pokhari burst in the Hinku Valley. Scientists say when Lake 464 bursts, it would be much bigger. “We don’t know how much water the lake contains so any downstream impact analysis of a flood on the settlements and infrastructure along the Hongu, Dudh, and Sun Kosi rivers requires more extensive study,” says Byers. Another problem with 464 is that villagers downstream have no idea the lake even exists because it is so high and remote. As with other new lakes in the basin, Lake 464 started forming only about 40 years ago, a clear indicator of global warming trends. Besides the overhanging ice masses, 464 also has a very fragile terminal moraine, and the terrain falls steeply into the upper Hongo valley to its confluence with the Dudh Kosi and eventually the Sun Kosi. “The accelerated melting of glaciers in the last three decades is a key indicator of global warming which threatens water flow in rivers fed by glaciers, puts the local communities at risk of frequent avalanches and glacial lake outbursts,” says Samjwal Ratna Bajracharya, lead author of the ICIMOD report. Besides permafrost, the Himalaya and Tibetan Plateau also act as a gigantic sponge that stores groundwater on which nearly 1 billion people downstream in China, southeast Asia, India and Pakistan depend. Melting glaciers make up 10 per cent of the annual water flow in the Ganga and up to 30 per cent in the Indus. Nepal has 3,808 glaciers covering a total area of 3,902 sq km with ice reserves of 312 cubic km. 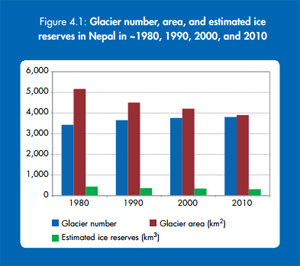 The ICIMOD study found that the rate of glacial area loss between 1980 and 1990 was almost twice compared to the rate between 1990 and 2010. “The snow cover was higher in the 80s which could explain the accelerated melting in that decade in comparison to the recent past,” says Bajracharya. That could mean glacier melting has slowed because there is less ice to melt. The ICIMOD report followed the dire conclusions of the UN’s Intergovernmental Panel on Climate Change (IPCC) which predicted that Himalayan glaciers would shrink by 45 per cent by 2100 if global average temperatures rose by 1.8 Celsius. 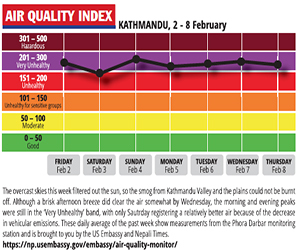 The annual mean temperature in Nepal rose by 0.04 Celsius/year between 1975 and 2005. Officials say a lot more needs to be done to map valleys threatened by hazardous glacial lakes in Himalaya that are in danger of bursting, and to transmit data in real time so towns and cities downstream have time to evacuate. “The accelerated melting of glaciers in the last three decades is a key indicator of global warming which threatens water flow in rivers fed by glaciers, puts the local communities at risk of frequent avalanches and glacial lake outbursts,” says Samjwal Ratna Bajracharya, lead author of the report.